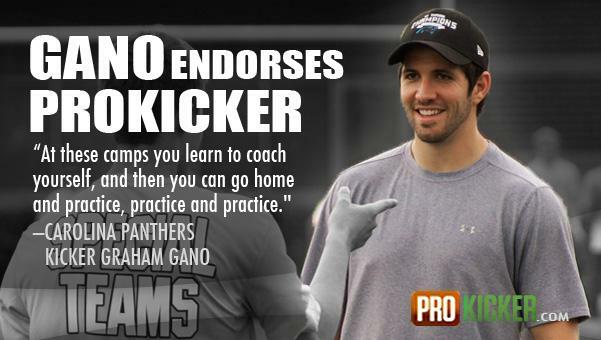 Graham Gano is kicker for the Carolina Panthers of the National Football League (NFL). Gano has played for the Washington Redskins and during his tenure there, he attained the Redskins' franchise record for longest field goal at 59 yards in 2011. Gano grew up in Pensacola, Florida and attended J.M. Tate High School, where he was an All-American First-Team selection by USA Today and the nation's third-ranked kicker by Rivals.com. Gano played in the CaliFlorida All-Star game, completing a 50-yard field goal in the game. During his senior season, Gano kicked three field goals over 55 yards (57, 64 and 65 yards) and had a 71-yard field goal made which was negated by a penalty. A total of 36 of his 38 kickoffs were touchbacks and he averaged better than 42 yards per punt as a senior. Gano attended Florida State University from 2005 to 2008, playing as a kicker and punter for the Seminoles. During his senior year in 2008, Gano finished first in the FBS for field goals made, percentage of field goals converted and 50-yard field goals made, and was the Lou Groza Award winner as the nation's top kicker. He was one of only two kickers in college to make over 90% of his field goal attempts in 2008. He was the highest scoring kicker in America and fourth overall in the FBS in scoring. He also was a Rivals.com, Scout.com and CBS Sports first team All-American. Gano was listed as Walter Camp, Associated Press, Sporting News, SI.com and he earned All-ACC First Team honors as well.